I spotted him last night. He was lurking behind the overgrown weeds that come up between the cracks in the sidewalk. I said hello. He remained silent. I moved to the left. His beady, black eyes followed my movement. I moved to the right. His gaze followed. He wasn’t talkative and that was okay. He was there to do his job and I left him to it. Early this afternoon I returned from an errand and found him again. This time he sat on the bottom step. I greeted him with a smile and said hello as I walked around him and went into the house. This silent creature with the black beady eyes makes me smile. He most certainly is a great, great, great grandchild of the legendary Algae. (Algae was one of the best guard toads that ever took on the invading hoards of ants.) I’ve yet to learn the name of the new enforcer of the steps but once he becomes comfortable in his new position, and with me, I’m certain he will share it. 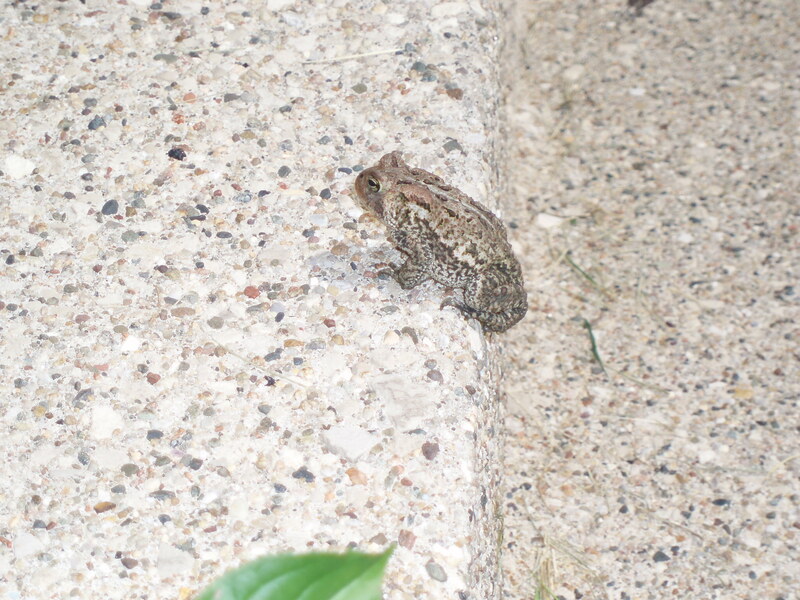 He grudgingly allowed me to take his photo but soon became impatient with his new celebrity and started to hop away. But here he is, my new guard toad. A month ago I lost my job. The phrase, “laid off due to reorganization” was used. With this lay off the company arranged for me the opportunity to meet with a “human resources” organization. These are folks who were, at one time, members of the human resources department of their respective employers. Their goal, to help the recently laid off find a job by spiffing up their resumes and teaching them to answer those ever so difficult questions like “tell me about yourself” and “do you like to work alone or as a member of a team”. All of which can be found for free on the internet or your local department of Workforce Development (or whatever your state calls it). Since my former employer is paying for these talking heads I agreed to meet with the one selected for me: a soul without a dream. That’s a hard phrase: “A soul without a dream” but it bears repeating. A soul without a dream. During my first session, probably when I was asked “tell me about yourself”, I told this advisor that in high school I had dreamed of becoming an animator for Disney but that through the course of my life, and accepting some limitations, I adjusted my dreams. The response from this soul without a dream was, “I never had a pipe dream like that”. A pipe dream. That statement has stuck in my craw since the moment it was spoken. No one should ever be told that their dream (no matter how old) is a pipe dream. It leaves a sick taste in the mouth and soul. It pushes the heart down and resentment up. How dare you. But as I have thought on it I began to feel sorry for the person who made the statement. How can you have never had a dream? Didn’t you want to fly in space? Be a cowboy, a doctor, a Broadway star? Didn’t you ever stand in front of an imaginary crowd singing your heart out wondering what it would be like to be a rock star? Did you really want to be an accountant when you grew up, a manager of the human services department? Why didn’t you have a dream? How could you not have a dream? I’ll never work for Disney. That time has passed. But maybe, if one of my children stories ever gets published…maybe Disney will purchase the rights to animate it. So, there’s still a dream…and if you don’t have a dream….what do you have?